I’m not one for fish unless it is grilled, but this is a fish recipe that I do enjoy and that I use regularly. 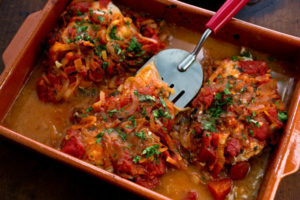 Broiled fish topped with a quick garden tomato sauce using summer grape tomatoes, fresh basil and garlic. I served this over orzo for a complete meal. This simple sauce is also great over fat free noodles, cauliflower mash or chicken. In a large skillet heat oil on high heat. Add garlic and cook until golden. Add tomatoes, salt and fresh pepper and reduce heat to low. Simmer for about 15 minutes, add fresh basil and cook another 5 minutes.